It has been a busy Monday but wanted to prepare a quick vase. Actually I made one last night but could not get decent photographs in the rainy evening light and in the end I was not satisfied with the design. Floral choices are limited this week so I have to default to another week of red camellias. 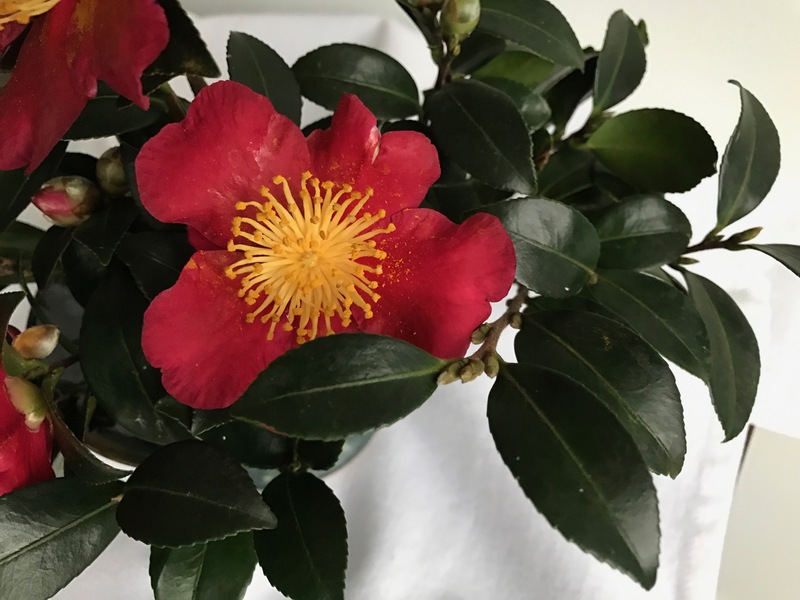 Camellia sasanqua ‘Yuletide’ is contentedly blooming in the early days of December. Some recent evenings have been down into the 30s F. but not below freezing, so the flowers have remained fresh. I cut larger branches today and quickly assembled a tall pyramid. The container is a new ceramic ikebana piece from my sister-in-law, who has been visiting for a few days. The vase has 3 integrated ceramic tubes, built-in stem holders which are quite a convenience. Water is added to the base and it flows into each stem for easy watering. Here is a peek at my earlier attempt. I conditioned the materials in a glass and never had time to move them into an actual vase. The surprise in this one is hard to see but toward the back is a single Rudbeckia laciniata (Green-Headed Coneflower), complemented with a couple of stems of Salvia guaranitica ‘Black and Blue’. Husker Red Penstemon picks up the red Antirrhinum majus (Snapdragon). Iris leaves are the final touch, folded over and tucked to create movement. Thanks to Cathy for hosting this weekly chance to express our flower arranging passion. Visit her at Rambling In The Garden to discover what she and others from around the globe are placing In A Vase On Monday. 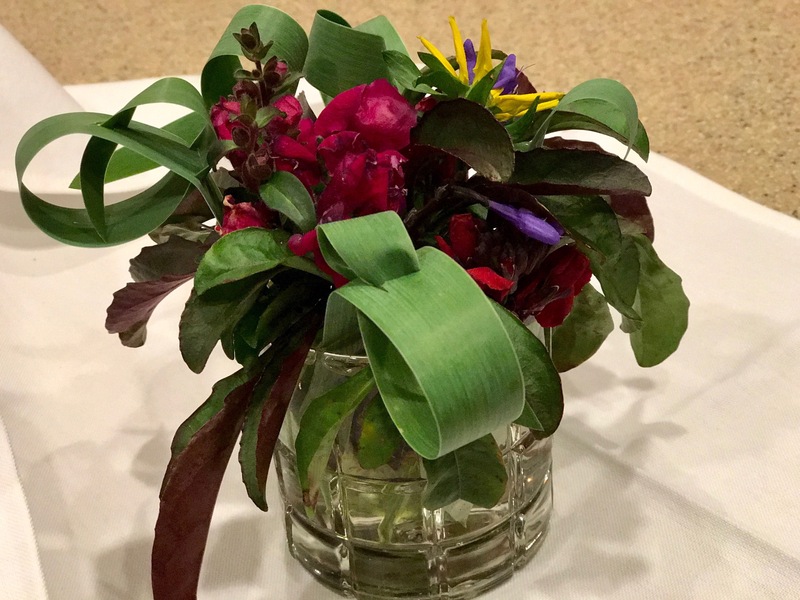 This entry was posted in Uncategorized and tagged Antirrhinum majus (Snapdragon), Camellia sasanqua 'Yuletide', flower arranging, flower design, in a vase on monday, nature photography, Penstemon 'Husker Red', Rudbeckia laciniata (Green-Headed Coneflower) on December 5, 2016 by pbmgarden. Gorgeous, the tower and I especially love the loops! You keep making a convincing case for ‘Yuletide’. The vase sounds like a winner. Ricki, I’m looking forward to trying out that vase when there are more choices of materials. Expect it will become a favorite. I love what you did with the Iris leaves, Susie! Your ‘Yuletide’ continues to look great while my noID pink Camellia sasanqua just look sad. Kris, maybe your sasanqua will have a better year next year. I just heard a talk on camellias and one piece of advice is to protect them from wind. Don’t know if that applies to yours but thought I’d pass it on. The iris leaves look so fresh right now I wanted to show them. You make me nostalgic about our Chapel Hill ‘Yuletide.’ I wish I had planted one here. I like your pink camellia even better John. Thanks Beth. Yuletide is doing the best this year it ever has. 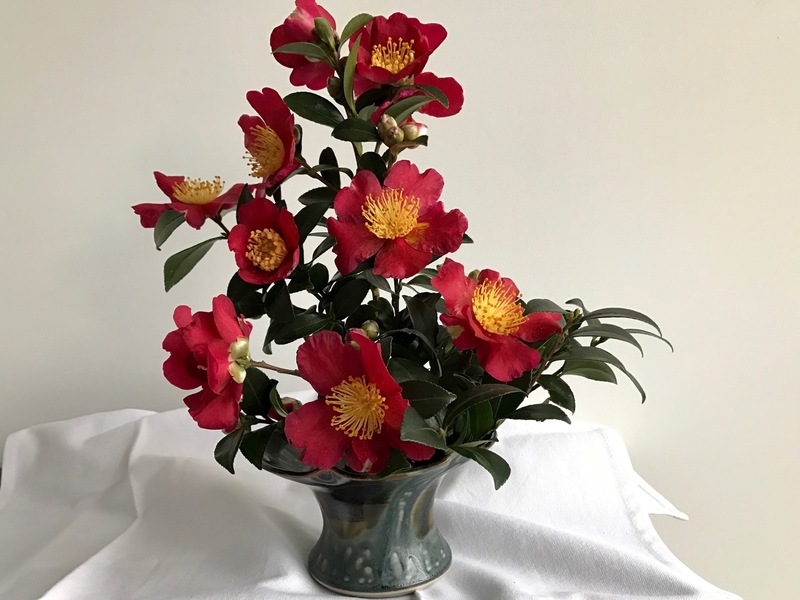 I think your vase gives us a taste of what your lovely Camellia must look like in the garden. 🙂 The vase sounds ingenious – your family are so good at finding gifts Susie! I like the folded leaves in your second vase – just seeing fresh lush green leaves is nice! Thanks Cathy. I was surprised at how fresh the iris leaves are right now. I’ll try to show a picture of the camellia outdoors. So far haven’t been able to get a goo photo of it. You’re making me wish I had bought ‘Yuletide’, maybe the nursery still has it! The tower is very effective, the vase mechanics sound very clever. You are always very clever with foliage, the folded Iris leaves are perfect. Thanks Christina. I like the new vase and look forward to experimenting more with it. Yuletide is really not my favorite–just happens to be one I bought before knowing how many other camellias there are available. But this week the flowers look fresher after some nice rains and it certainly is seasonal. I had to explain at the nursery what Yuletide meant, they obviously had no idea. Fabulous Susie. Every time I see your Yuletide I wish I had one one. They are rather expensive here but I think I may have to invest in one. My pink Camellia sasanqua is quite pretty but this is stunning. The vase is pretty too and how practical. Thanks Liz, Yuletide is very reliable and appropriate in color for this time of year. You’d probably not regret going ahead with buying one. 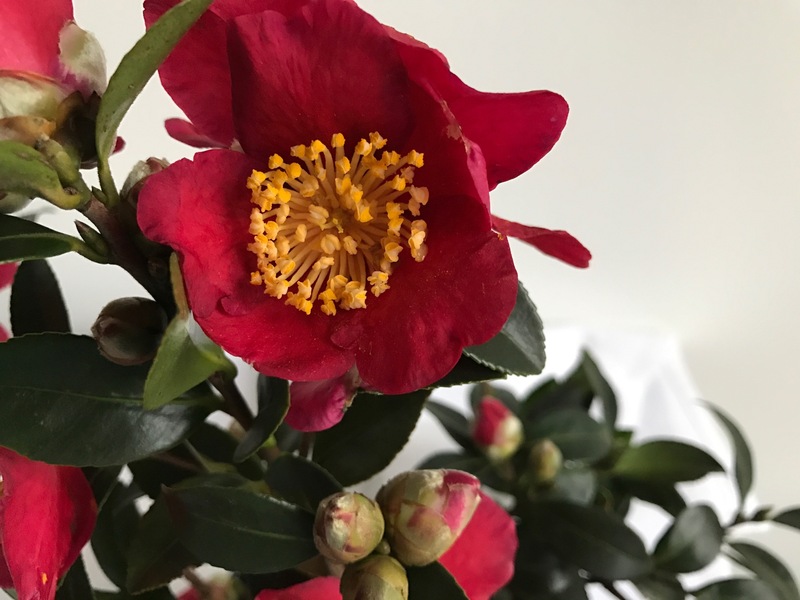 Camellia sasanqua ‘Yuletide’ is a beauty and looks great in your pyramid. I love the woven leaves in your sneak peek. Very clever. Thank you. Yuletide has its charm. It’s fun to play with leaves and manipulate them into new shapes. I have a book that illustrates many techniques. I should locate the book and practice this winter. 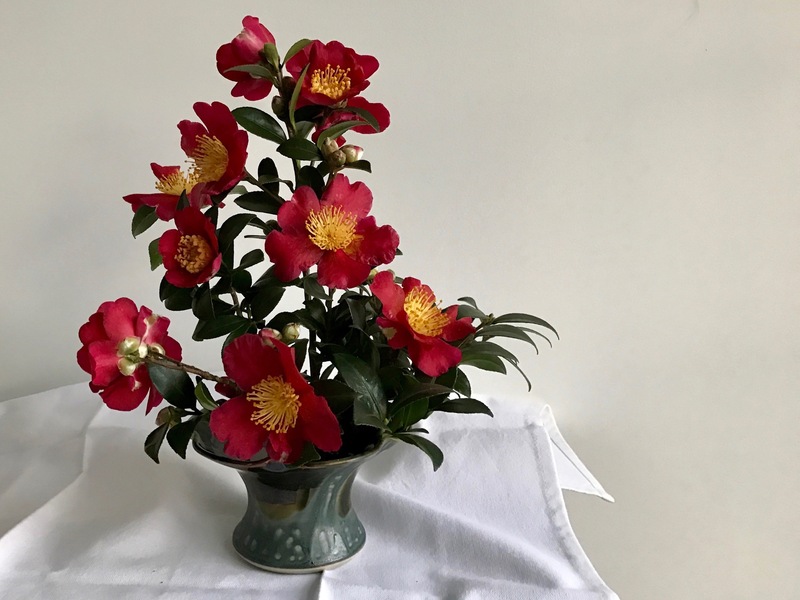 Your Camellias look beautiful in the vase an are such a pleasant sight now that there is not much blooming outside. I enjoyed your first attempt of the vase as well with the folded leaves…very clever! Thank you. There are a lot of ways to manipulate leaves that can be very effective. I need to practice that more. Beautiful Camellias. Do I need another plant in a pot since I cannot grow it in the garden? Very tempting. Yes, room for one more? Could keep company with your jasmines. Hope you’re doing well. Watch out, I may just get wild one of these days. The camellias seem to dictate order and formality. Thank you. Yuletide has been exceptional this year.